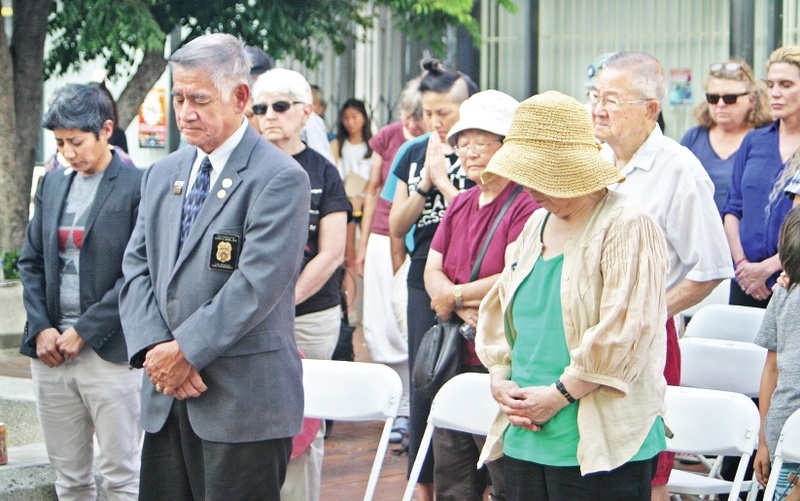 A rally was held Aug. 8 in Little Tokyo’s Frances Hashimoto Plaza to commemorate the 73rd anniversary of the Hiroshima and Nagasaki atomic bombings and to support victims of the 2011 nuclear disaster in Fukushima. Speakers included M. Kato (pictured at right with Tsukuru Fors of the Fukushima Support Committee), a Fukushima evacuee, an immigrant mom and a cancer survivor; Fumiko Kometani, writer and peace activist; Michael Lindley, chapter president, Veterans for Peace-Los Angeles; Lydia Ileliya Ester Ponce, AIM Southern California; Rev. Ryuzen Hayashi of Koyasan Buddhist Temple; Rev. Dickson Kazuo Yagi, emeritus professor of Christian studies, Seinan Gakuin University (Fukuoka); Frances Yasmeen Motiwalla, deputy director of development, Peace Action; and Keshy Jeong of Eclipse Rising, a U.S.-based Zainichi Korean group, reading a statement on behalf of Haruki N. Eda. The program also included a taiko performance by Maceo Hernandez, the releasing of doves, and a moment of silence (pictured above) at 7:02 p.m., the exact time — 11:02 a.m. on Aug. 9 in Japan — that Nagasaki was bombed in 1945. 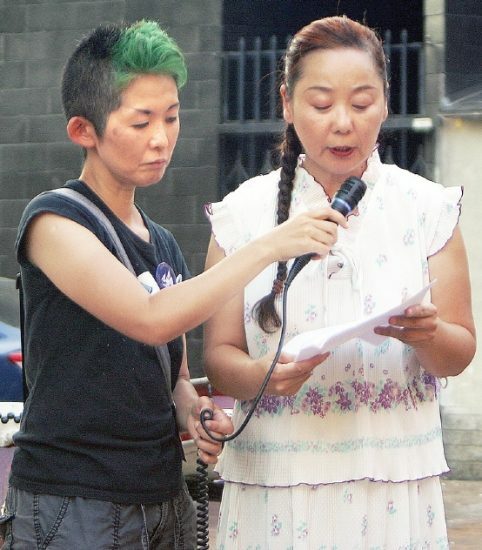 The speakers called for an end to nuclear weapons and nuclear energy, and healthcare and reparations for the Fukushima victims, many of whom remain displaced more than seven years after the tsunami due to radiation from the damaged nuclear power plant. “This year’s event was very special for two reasons,” said Fors. “One: The L.A. City Council passed the resolution on that very morning to support the U.N. Treaty on the Prohibition on Nuclear Weapons and other critical security measures. The Fukushima Support Committee also held an event on Aug. 5 at Santa Monica Pier in collaboration with Veterans for Peace-Los Angeles. The event is usually a public installation called “Arlington West” with red and white crosses representing U.S. soldiers killed in Iraq and Afghanistan, but this year a peace symbol was created along with the number 73 to commemorate Hiroshima and Nagasaki.